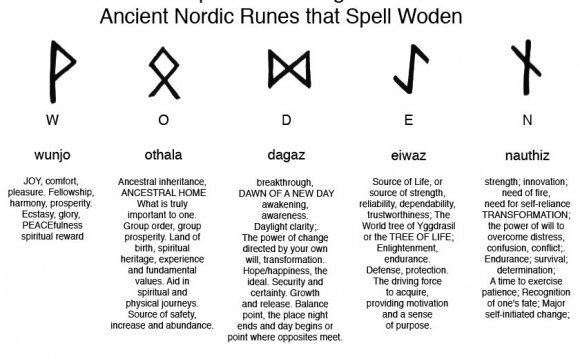 The Names of the deities are in the old Norse language while the Rune names are in German. Aegir, of the Vanir: The Ale-brewer and King of the Sea. Son of the giant, Fornjótr, and brother of Logi (fire, flame) and Kári (wind). He is a jotunn, (giant nature spirit). Married to Ran, they had nine daughters (undines), each characterizing some aspect of ocean waves. Using a large cauldron given by Thor, he and his daughters brew ale. Aesir, Asynur pl. : The Old Gods. The Old Gods are strong, beautiful and larger than humans and live longer than humans, but are not immortal. Each God has expertise in different categories. They generally are good, friendly and helpful to humans. Those Vanir who have lived in Asgard for a long time are also considered as Aesir. The Aesir are the gods of consciousness and the sky as opposed to the Vanir who are the gods of the earth, biological life, and the subconscious. The Aesir are direct descendants of Odin through the father, or are females who have married (male) Aesir. Audhumla: The Great Cow. Nourisher. Primal shaping force of the universe. Baldur (German Phol), of the Aesir: The Bright One. His name means “Shining Day.” Odin's second son, he is the god of Love, Light, Beauty, Loyalty, Innocence, and Rebirth. He is sacrificed at Midsummer by the dart of the mistletoe, and is reborn at Yule. He is married to the goddess of Joy, Nanna, and is father to Forseti. He was slain by his blind brother Hodur whose hand was guided by the evil Loki, and will return after Ragnarok. Bragi, of the Aesir: The bard of the Gods and the God of Eloquence, Poetry and Wisdom. He is a son of Odin and Frigg, and husband to Idhunna. Eir: A lesser known Goddess of Healing. Forseti (German Forasizo), of the Aesir: His name means “Chairman.” He is the God of Law and Justice. A son of Balder and Nanna, Nep's daughter. His hall had a silver ceiling radiating light seen for a great distance. Rulership: justice, law, mediation, peace, reconciliation, truth. Freyja: (German Fricco) of the Vanir: She is the Great Goddess, second only to Frigg. Her name means “The Lady.” The Goddess of the magic known as Seidhr (German Seith) which she taught to Odin, eroticism, physical well-being; She is the Queen of the Valkyries who choose those to be slain in battle and carry them to Valhalla. She is daughter of Njord, and twin sister to Freyr. She is also a warrior goddess of great wisdom and magick. She wears the sacred necklace Brisingamen, which she paid for by spending the night with the dwarves. She is married to Odr and her children are Hnoos and Gersemi. Hers is the magic of reading runes, trance & astral travel, and casting spells. She owns a falcon cloak, takes dove form, rides in a chariot drawn by two cats, or rides a boar. She weeps tears of gold, which become amber, called "Freya's Tears". Symbol: the boar, cat, Full Moon, necklace, number 13, 5-pointed star. Freyr (German Fro ), of the Vanir: His name means “Lord, ” and he is the lord of prosperity, eroticism, peace, and physical well-being, and his weapon is a magic sword and he has a magic ship that sails unguided to its destination. He is Freya's twin brother and is married to Gorda. Like the Celtic God Cernunnos, he is the horned God of fertility and King of the Elves. He is married to Gerd and is father to Fjolnir. His golden boar, Gullenbursti, is the dawn of day. He rules over Alfheim, the land of the Light Elves. He and Freyja are the archetypal Lord & Lady of Wicca/Witchcraft. Frigg (German Frija, Fricka), of the Aesir: Her name means “Love, ” and she is Odin's wife, and mother to Baldur and Hoor. She is the Goddess of Civilization and the true Mother of all and protector of children. She spins the sacred Distaff of life, and is said to know the future, although she will not speak of it. Rulership: abundance, childbirth, children, creative arts, cunning, empowerment, enrichment, magical powers, marriage, physical love, and may be invoked by the childless. She teaches women all domestic crafts as well as farming. Gefion, of the Vanir: The Giver. The Goddess of Virtue and un-married women: A fertility goddess and a shape-shifter.